Lauren Crazybull kicked off her Residency by opening the doors to the McLuhan House studio for friends, family, and our neighbours to see where she would be spending her next year. As our Resident Artist, Lauren will have the use of the studio until June of 2019. Lauren understands that her creative power is a poignant way to assert her own humanity, and advocate, in diverse and subtle ways, for the innate intellectual, spiritual, creative and political fortitude of Indigenous people. She is well on her way to filling the world with art-making that she believes is more important than every. Lauren is an Edmonton-based Blackfoot Dene and has spent years mentoring youth. She is devoted to continuing her path as an independent artist and youth worker and hopes she will empower other Blackfoot and Indigenous young people through her passion; art. As an Indigenous women, Lauren feels her art is one way to deal with the complex nature of her wide range of emotions and she uses her gifts to help the rest of the world expand its understanding of justice, humanity, and love. 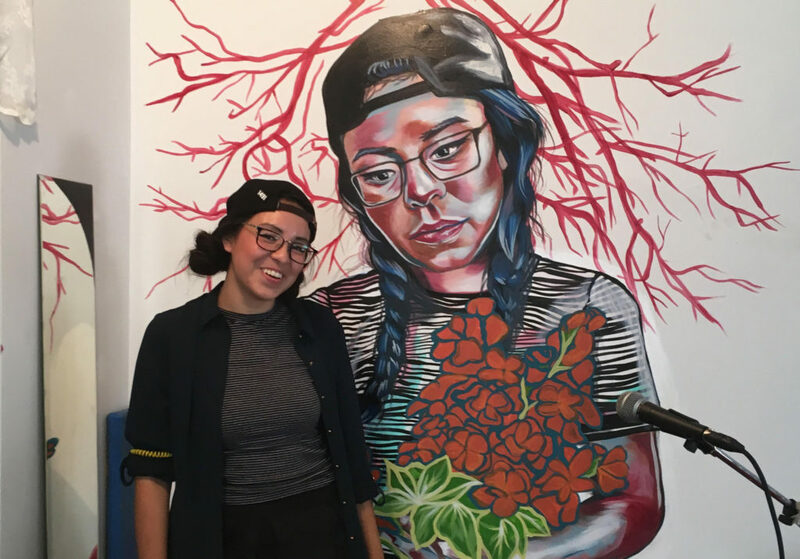 She invited musicians Jayden Paz, Family Injera, Jordan Koe, and Matthew Cardinal to entertain her guests at the Open Studio Event and those in attendance were also treated to seeing her work on display. The studio was THE place to be on Sunday, July 15th! The local musicians entertained the packed studio and from the smiles on everyone’s faces, the event was a success. This was just the beginning of great things to come! McLuhan House strives to engage in ideas and artworks that expand our thinking. It is a dynamic community gathering place that draws the neighbourhood, academic researchers, artists, and cultural workers together. We have no doubt that Lauren will lend to that ideal and we are excited to watch her over the next year! You can check out her work by clicking here.